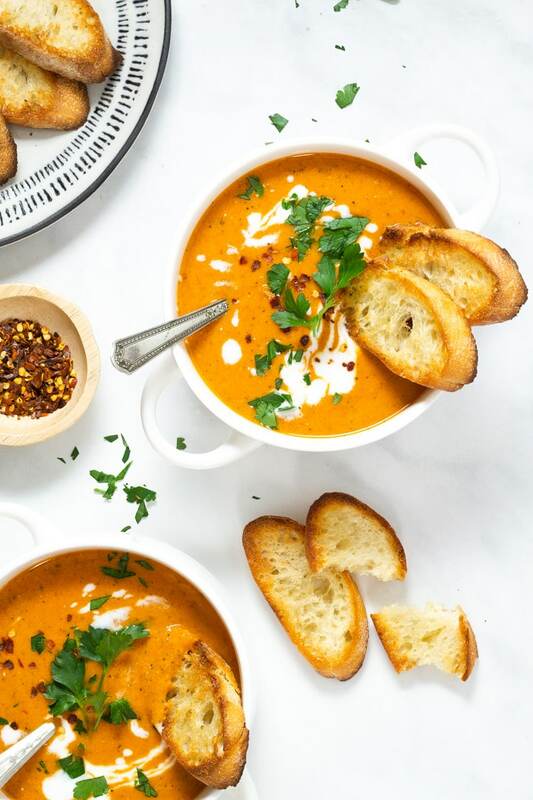 Less than 10 ingredients and 25 minutes is all that stands between you and this hearty vegan tomato soup! The secret ingredient is canned tomatoes, which means this meal a breeze – even on a busy weeknight! 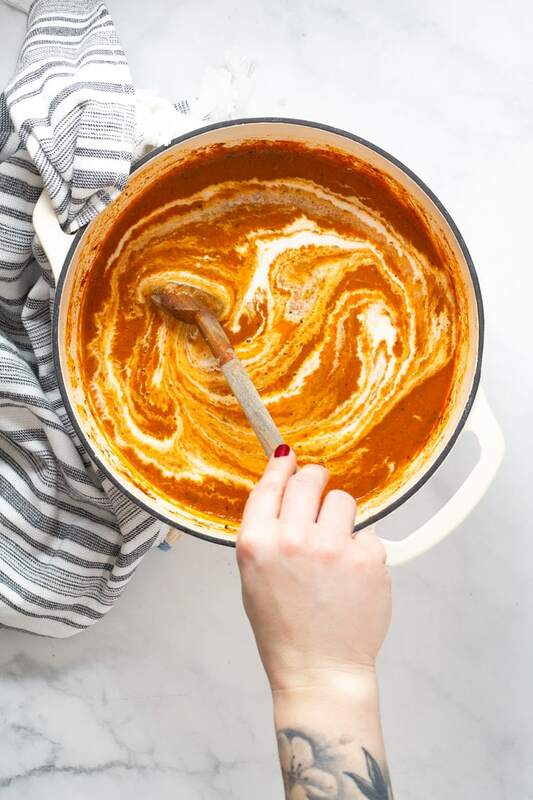 How do I make vegan tomato soup? The soup could not be easier! You’ll combine sauteed onion and garlic with vegan pesto and oregano to make a souper flavorful base…see what I did there? Then add canned tomatoes and veggie broth and simmer everything together for 10 minutes. Give everything a quick blend in a high speed blender until smooth. Stir in coconut milk (or heavy cream). Season to taste with salt and pepper. Warm on the stove until heated through. Then garnish with parsley, coconut milk, red pepper flakes and crostini. It’s important to exercise caution when blending hot liquids in a blender! Because the liquid is hot it will give off steam. 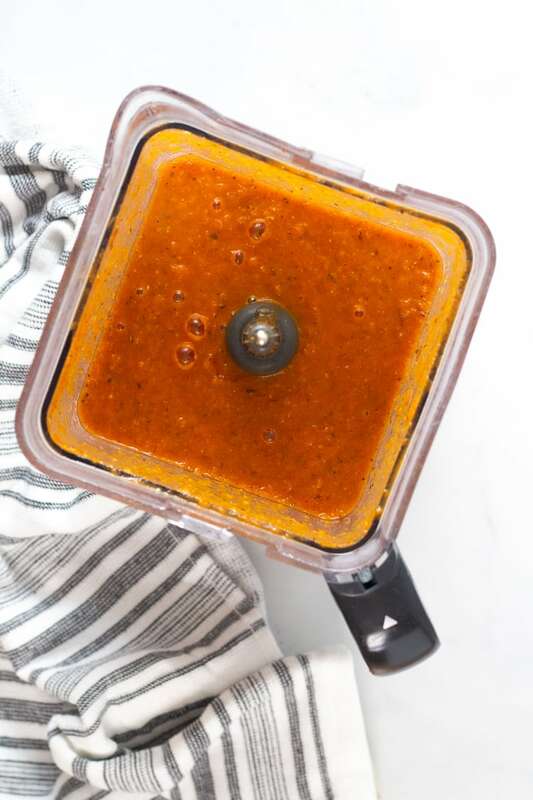 If you put the lid on the blender and seal the hot liquid inside, when you start to blend the lid of the blender will inevitably fly off, spraying hot soup everywhere! To remedy this situation you can leave the pour spout or the center hole of the blender lid (depending on which model you have) open and place a clean kitchen towel over the opening while you are blending. This will ensure that any flying soup gets caught by the kitchen towel and will allow the steam a chance to escape so you don’t end up with kitchen cupboards covered in soup! 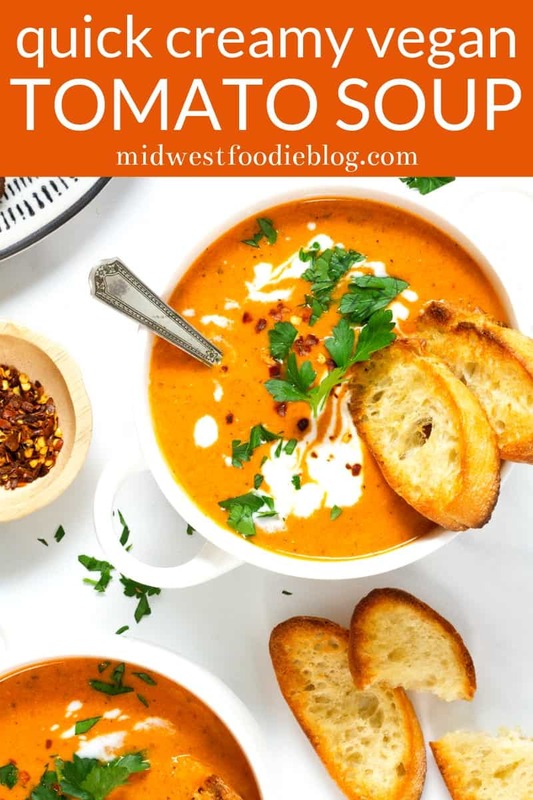 Can I make this creamy tomato soup ahead of time? Sure can! 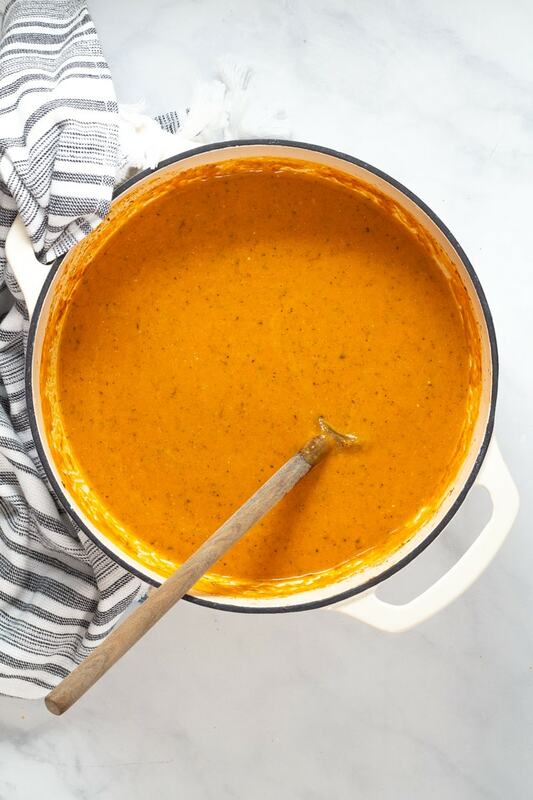 The flavors of this vegan tomato soup just get better with time and it will stay good in the fridge for up to a week. Usually when I meal prep on the weekends I make three meals. One soup, one salad or pasta salad and then one wild card meal – usually tostadas, baked ravioli or one pot pasta. This gives us options throughout the week so we aren’t eating the same thing everyday and ensures that I won’t need to spend much time in the kitchen during the week. 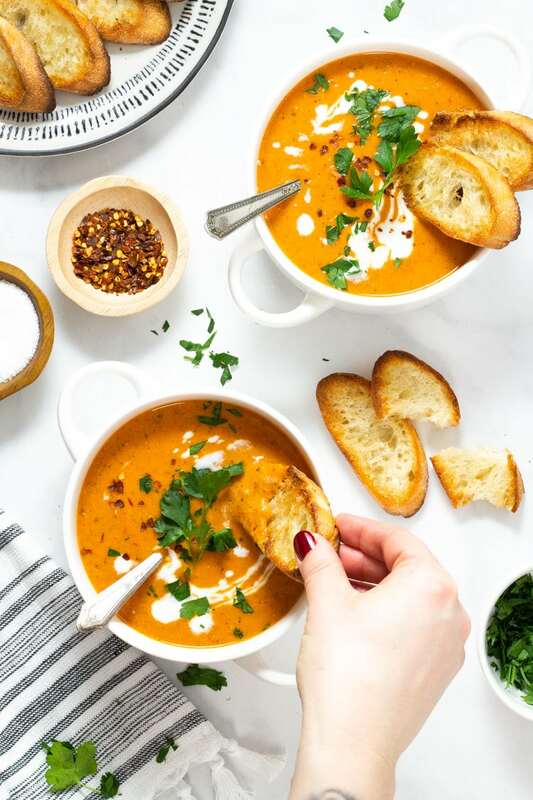 And this soup is on a permanent rotation on our meal prep menu because it’s so easy to make, it tastes great and it reheats so well! What are those cute little toasted pieces of bread in the bowl? How do I make those? Crostini! AKA the love of my foodie life. Crostini are slices of French bread that have been drizzled with olive oil and baked or broiled in the oven so they get golden brown and toasty. You can top crostini with whatever you’d like. My personal favorites are: Apple Brie Crostini and Burrata Crostini. 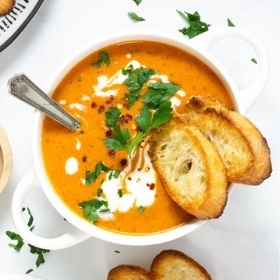 You can also just leave the crostini naked and dip it into a creamy soup, like this one! It’s basically like a giant crouton and it’s the best thing ever. Definitely worth the 2 minutes it takes to make them! 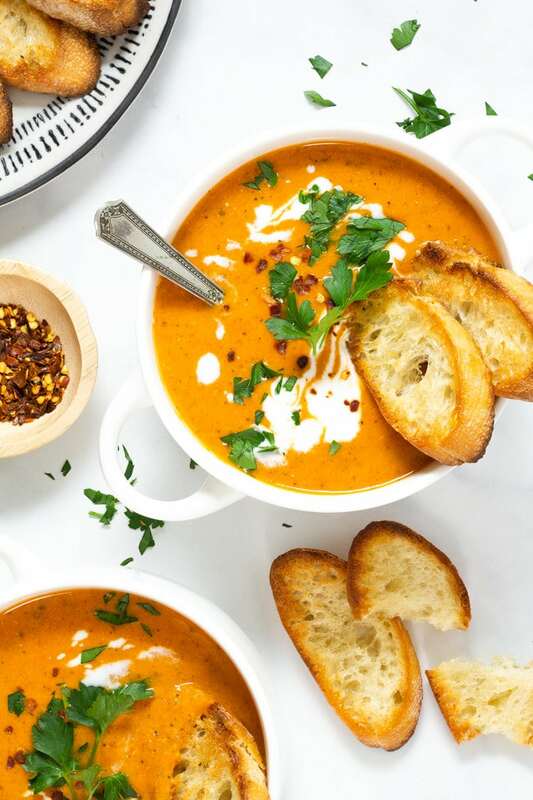 This tomato soup is so hearty and filling, you’d never guess it’s completely free of animal products and super healthy! Heat oil in a large pot over medium heat. Add onion along with a large pinch of salt and pepper and cook, stirring frequently for 3-4 minutes. Add garlic and cook for another minute. 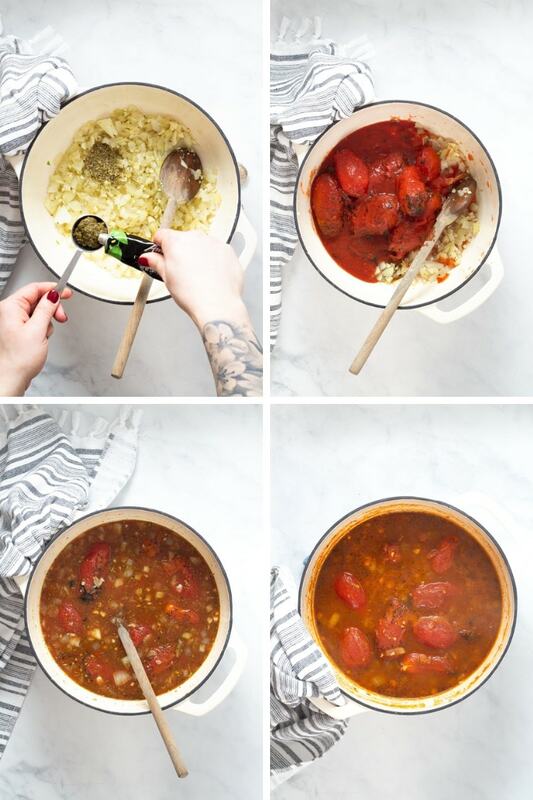 Stir in pesto, oregano, sugar, tomatoes and vegetable broth. Turn heat to high and bring to a simmer. Lower heat and simmer over medium low heat for 10 minutes, stirring occasionally. Carefully transfer soup to a high speed blender and blend for about 2 minutes, or until smooth and creamy. Be sure to leave the pour spout or center hole on the blender lid open and then cover the opening with a kitchen towel to prevent the lid from flying off and covering you in hot soup! Pour soup back into the large pot and stir in coconut milk, reserving a couple tablespoons for garnish if you’d like. Season to taste with salt and pepper and heat over medium heat until warmed through. Garnish with remaining coconut milk, fresh chopped parsley, red pepper flakes and crostini (see notes below). To make the crostini: Slice French bread into 1/2″ thick slices and lay on a baking sheet. Drizzle with olive oil and broil for 1-2 minutes or until golden brown. Flip bread over and broil the other side for 1-2 minutes or until golden brown. 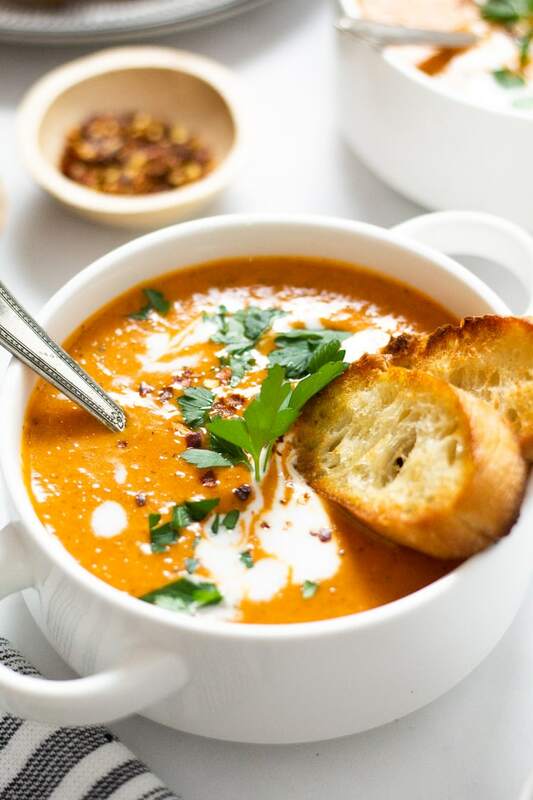 Serve with soup and enjoy!